Jay has already referred to the fact that templates will feature in this top 50, something which is hardly surprising. This shirt is ‘kind of’ a template but, at the same time, it’s one of a kind, as was the case with many Cork City kits. When the club was established in 1984, the club wore a kit very similar to the classic Queens Park Rangers adidas kit of the time, with green replacing blue. For the next five seasons, five variants of this style were used – none, as far as we are aware, worn by any other adidas club. The reason for this was that Irish sportswear firm Three-Stripe International was based in Cork, producing adidas clothing under licence, allowing them to come up with bespoke looks for the local side. In 1989, City made it to the FAI Cup final for the first time, against a Derry City side seeking to win the domestic treble, and, to mark the occasion, a very new departure was taken on the outfitting front. The final was lost, 1-0 after a replay, but that didn’t detract from just how good the new look was. Taking inspiration from the West Germany kit introduced at Euro 88, the shirt was now predominantly white with a green and red zig-zag across the front. 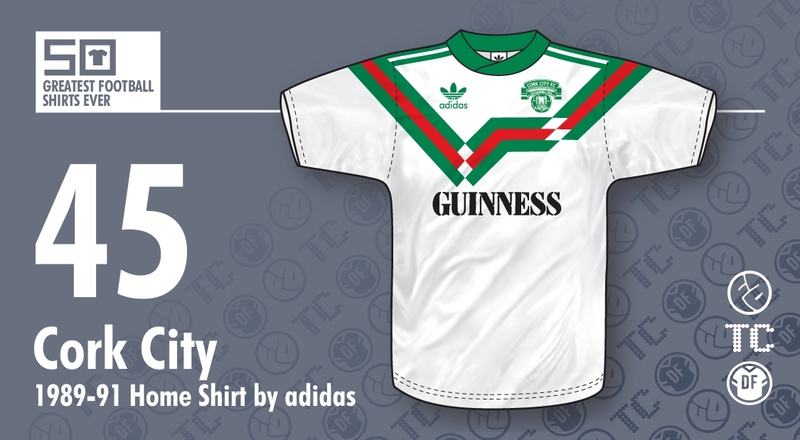 It wasn't a simple re-colouring of the West German look though, as the pattern was higher up the chest and also featured narrower colour blocks, creating room for the sponsor, Guinness. That the name of Ireland’s most famous export was across the chest no doubt accounted for some of this shirt’s popularity outside of the club’s catchment area. Just look at the company it’s keeping here without looking out of place, while The Beautiful South also did their bit to raise exposure. Even now, the periodic ‘best-ever kit’ polls on the Cork City supporters’ forum will have this on or near the top, even though these days the club’s first-choice kit is a reversal of what it was then, with green shirts with white shorts currently favoured. That may be better than, say, the dalliance with previous away colour red as a home kit, but, for some, white should always be the primary colour and this shirt will be the standard against which all successors are measured. Huge thanks to Denis. He can be followed on Twitter here and his site, CorkCityKits.com, demonstrates that this shirt is certainly not the only impressive example the Rebel Army have turned out in. Denis also tweets news and his views on GAA kits here, for his legendary compendium, Pride In The Jersey.